Update 15: 2007 will be a year of hope! Update 14: Coming Soon - Improvements to website are on the way! As most of you know, our family recently suffered the loss of our most vibrant, energetic and visible member. Our loss presented our family with the greatest challenge any of us will likely ever face. We all initially searched our minds in an effort to determine what we would need to do to get through this very difficult time. It became clear very early in the process that it would be all of you who would help carry us through this incredibly difficult time. Your outpouring of support in the form of cards, telephone calls, mass cards, stories, flowers, food, donations and well wishes has initiated the healing process for all of us. For her family, it has been most special to hear your personal stories about your experiences with our Leanne. The stories have provided us with the thoughts we needed to gain and maintain strength during our time of challenge. Never ending thanks to all!As a family we are now focusing our thoughts and efforts on making the future as bright and loving as ever for Leanne’s three greatest accomplishments, her children. We all have lots to do! As a family we recently celebrated Larissa’s second birthday, Little Ronnie is looking forward to re-joining his school mates as he prepares for the second grade and Joseph will have a fourth birthday this fall and has plans to become a Power Ranger some day. They are strong, intelligent, energetic, fun children who are and will always be surrounded by family and friends who love them. Leanne’s Dream Foundation and the team at the East Boston Neighborhood Health Center would like to thank Rob and Shannon Torres, co-owners of Digital Reaction Design and Development for the volunteer work. Rob, who is a childhood friend of Leanne, contacted the foundation when he heard a fund was being set up in her memory. Rob immediately offered to apply his skill and commit his time to helping us set up this foundation. This entire web site and the beautiful logo you see on the t-shirt and the web site were designed and donated by Rob and Shannon. On behalf of our entire team we want to thank you both for the wonderful contribution. This logo and this web site will help us carry on Leanne’s memory forever. Thank you for you response in the form of financial contributions to this foundation over the past few months. The response has been beyond incredible and a true testament to the type of quality person Leanne was. The outpouring of support from Leanne’s family members and friends has been almost overwhelming. We have received a fantastic number of contributions since Leanne’s passing on July 17th. The process of setting up the foundation has been incredibly therapeutic for all of us here at EBNHC. We have even received several calls for volunteer support. Thank you for the calls as well!We are in the process of sending out all of the thank you letters and setting up the budget for the foundation. From there it will be time to put your kindness to work. We have lots of ideas on how to help out those in our community who need the help. As we know you have entrusted us with your memory of Leanne we promise all of you that we will act very carefully with your donations. We also promise that every dollar will go to helping out somebody in need. We also promise to continue to keep you updated, through this web site, on the specific activities of the foundation. We have lots in the works so keep checking in to see what we have been doing to help those who are less fortunate and to memorialize our co-worker and friend. Another wow! We ordered 500 t-shirts with the LDF logo on them. We thought this stockpile would last us a year or so. The t-shirts lasted less than a month and we have had to place several additional orders over the past couple of months. This is just another testament to your affection for Leanne and her work. Again, all of the funds will go into our budget of annual charitable activities. We will be putting the funds to work ASAP. EBNHC team member and LDF steering committee member Gina Gallo recently entered a road race in Winthrop Massachusetts came away with a big victory. Gina a close colleague and friend of Leanne had the idea to run for Leanne and the foundation. Not only did she raise some money for the foundation but she also found a way to win her race category. Gina crossed the finish line, wearing the LDF shirt, in first place! Awesome! We are incredibly proud of her and we look forward to her continued success and commitment to the foundation. Way to go Gina! What a great tribute to your friend and colleague! We hope to post a photo or two in the future so keep your eyes open for updates. As many of you know, TD Bank Financial Group was one of the first donors to step up and support Leanne’s Dream Foundation. In fact, the team at TD was one of the first to write a check to get the fund off the ground more than three years ago. Just this past week the executive staff at TD restated their commitment to help support the foundation. TD will be working closely to identify fund raising opportunities to support the foundation. We cannot thank them enough and look forward to keeping you all updated on their involvement with our organization. The entire TD organization is committed to philanthropic assistance in their local communities and they are very involved when it comes to supporting programs that promote literacy. We enjoy their partnership and appreciate their commitment to helping this foundation become a major success. Over the past two months Leannesdreamfoundation.org has been visited by, literally, thousands of friends and family members from across America and from spots around the world. The first run of visitor statistics is in! As mentioned, the site has been visited by thousands of people who have viewed about 10,000 pages. Your support is greatly appreciated. For those of you who continue to visit on a regular basis please take a minute to leave a note for Leanne or the members of her family on our memorial message board. Reading your notes and comments has been great for all of us. It really warms the heart to hear your personal stories of your time and experiences with Leanne. Keep checking back in as we will continue to post updates from the foundation as well as your stories, poems and letters. The great news is that the pace of visitors does not seem to be slowing down. We get more and more visitors each day. We will continue to post updates so we hope you will continue to visit the site. The following is a list of states and countries we have had visitors from. The management team at TD Bank Financial Group has stepped up, again, to help support Leanne’s Dream Foundation. The bank has made a substantial financial contribution to help the foundation and EBNHC in their efforts to make lives better. TD Bank Financial Group is one of the leading philanthropic financial service firms in North America. TD has a huge focus on charitable programs that promote literacy and education. Their partnership with LDF is a natural match. The foundation will be using funds from their contribution to help out with, among other things, the EBNHC mentor/tutor program. An enormous debt of gratitude to the folks at TD for helping us to help change lives for the better. Leanne’s cousin Jean recently put together what she thought would be a small book drive to help out EBNHC and LDF. The idea was to collect a few children’s books printed in English and Spanish to help with the health center’s literacy promotion efforts. The turnout has been beyond spectacular! There are almost too many books to keep up with and we want to thank all of you who participated. Leanne would be thrilled with the turnout! We wish we could we could share with you the feeling we get when we are able to provide a family with this kind of assistance. You are doing a great thing when you provide a family with educational support. We believe that education is the key to most things in life and you are helping us to provide this key to many. A huge congrats to Jean on the success of the program! The books will be a great addition to our programs and will help the kids to take their reading skills to the next level. One of the things that is healing for us at the health center and for family members and friends is reading your stories about your great experiences with Leanne. One of the best contributions you can make to this foundation is a taking a minute to leave a story, message, poem or inspirational passage on our memorial message board. The message board will be a part of this site forever and it will be a great tool for Leanne’s family members, friends and children to remember her. Your stories will become part of the permanent archives of this foundation. Thank you, in advance, for helping us put down on paper the history of the great life that was Leanne. Your stories will be passed down for generations to come. On November 22, 2006 the ladies from Leanne’s Dream Foundation held an incredibly successful bake sale at the East Boston Neighborhood Health Center. The ladies baked all day on Monday and set up shop outside of the EBNHC pediatrics department on Tuesday. In just a few hours, and with items priced very low, Leanne’s Dream Team sold almost $1,000 worth of cakes, cookies, brownies, candies and anything else you can imagine. This is an incredible accomplishment that will provide a very specific benefit to the EBNHC community. One of the passions Leanne shared with her colleagues from the EBNHC Volunteer Services Department was to provide local kids with experiences they might not have access to on their own. With that philosophy in mind, it looks like we will be sending a few more local children to camp next summer! This is exactly what Leanne and her colleagues would have worked on together. We are all very excited and we hope you are excited to see your contributions going straight to work. East Boston Camps has been around since 1937 and each year they welcome over 300 East Boston boys and girls between the ages of 6 and 14 to 400 acres of woods and lake. The camp is a one to two week overnight camp in Westford Massachusetts. The kids will join other children sponsored by LDF and they will spend their days swimming, on nature walks, working on arts and crafts and just having fun. Most important, they will be making friends, interacting with great counselors and a having a great summer experience. Thank you all for all of your support! This is the type of activity you are supporting and, on behalf of the kids, thank you to all! This not just summer camp! This is an opportunity to impact their life forever. 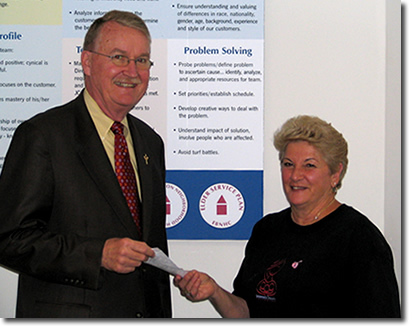 On November 16, 2006 Leanne’s mom, Lea, presented a check to Mr. Jack Cradock, CEO, EBNHC. The check was for TD Bank Financial Group’s year-end contribution to LDF and was in the amount of $15,000.00. TD Bank Financial Group was our original corporate sponsor and they continue to set the bar high for our other corporate partners. This is a great example of how a local company gets involved with a local initiative. Lea also presented a second check for $1,000.00 and this is a great story! The team at Leanne’s restaurant decided to take a dollar or two from their tips at the end of each shift and drop it in a kitty for LDF. The idea caught on and everybody continued to make contributions. They raised $1,000 and they did it a dollar at a time. We don’t just view this as money donated! We view this as kids sent to camp or books purchased for families or warm clothes in the winter or toys for local kids during the holidays. What a great effort! Congratulations! We posted these stories together because we wanted to stress the importance and spirit of volunteer service and charitable participation. Whether it is a corporation making a large contribution or a single individual keeping an extra dollar aside it all counts the same. To us, a dollar buys a book or a toy for a kid and that can make their day special. $10 buys ten books or toys that may make a day special for ten kids and so on. Even with this large contribution included a great percentage of our donations have come from individual friends family members of Leanne. Just good people taking the time to send in what they could and making a huge difference in the process! Thank you! How You Can Help – Drop off a new, unwrapped toy for a child. Toy Price Range – No more than $15 per toy please! We want to make sure all of the kids have an equal holiday experience. Toy Age Range – Toys for children 18 months to 14 years. When To Drop – December 4th Through 14th. Drop Location # 1 – Maggio’s Restaurant – 306 Revere Street, Revere Ma – 781-289-6950. Drop location # 2 – EBNHC (Volunteer Services Office) – 10 Gove Street, East Boston, Ma. 617-568-4865. Toys Will Benefit – Families of The East Boston Neighborhood Health Center. So basically here is how it works: You help us out by dropping off a toy or two and we will do the rest on your behalf. On December 18th and 19th we will setup shop and distribute the toys at our Addison Street location in East Boston. Smiles for those who give and smiles for those who receive! Helping others helps us to heal so thanks in advance for all of your support! Email Updates – Many of you have asked us if we can update you by email or regular mail when we have events, activities or announcements from the foundation. We are in the process of installing a function on the site that will allow you to choose to receive updates via email, regular mail or not at all. We might even publish a newsletter in the new-year. We don’t plan on sending out messages for every update but we will keep those who participate updated on major announcements posted on the site. New Message Navigation – Right now the website has two sections for messages. We have the “Activity Updates” page and we have the “Message Board” page. As you know, the “Activity Updates” are from the foundation and the “Message Board” includes all of the great messages from all of you. Right now these have separate navigation buttons. We are going to consolidate these into one button so that it is easier for everybody to search the site. In the future, the navigation button will probably read “Activities/Messages” and will have a sub-menu that will include links to the message board, LDF activity updates and our new “Dream Postings” (see below). Leanne’s Dream Postings – Leanne’s Dream Postings will be all about sending messages out to the community with the idea of helping everybody to heal. Leanne was all about positive energy and would want the people she cared about to try their best to feel better. From time to time we come across stories, poems, songs, ideas or messages that help us to heal a bit. We want to share this stuff with you as one of our objectives is to help Leanne’s loved ones (this includes all of you) to get through this tough time. Leanne will rest peacefully if she knows we are trying to heal and trying to make the most of our lives in her honor. LDF Store – Also at your request we will launch an online store soon. The store will be built into the LDF website but will be run by a private vendor who will help us with billing, printing and shipping. Unfortunately, this means that if you order stuff on the website you will have to pay a little more. We just don’t have the resources yet to run the store on our own. Hopefully, in 2007 we will find a way to have the store run by the foundation. You will be able to visit the store by clicking on the LDF Store link on this website. EVERY PENNY WILL GO TO THE FOUNDATION! Photos – We continue to get lots of requests for more photographs of Leanne. We are getting it done – we promise! We have some photos from way back and we have some recent images as well so we will be posting them in the new-year. When they are posted you will be able to download and print them on your home computer. Keep checking the website as the photographs will be posted soon. Thank you again for helping us to make dreams come true and we look forward to keeping in touch with all of in 2007. With the coming and going of December 31st we leave behind what has been an incredibly challenging year for all of us. As 2006 slowly passed, many of us likely experienced each day as a time of loss, challenge, confusion and grief. The pain of losing somebody who has played such an important role in all of our lives can seem to be almost unbearable at times. People have been forced to question their beliefs as well as their own personal strength to endure. “How will we ever get through this?” has been the question we have asked over and over again. It is impossible for any us to predict how we will get through, but it is becoming very clear that we will. We will continue to recover and adjust to our new life without the physical presence of the special person who lit up all of our lives each and every time she interacted with us. Her energy, however, will never leave us. She is there each day guiding us and pointing us in the right direction. Although there can never be any “good” that comes from this loss, there are countless stories of hope connected to the painful recovery process. 2006 will always be a year of loss for us but, unexpectedly, there will always be an underlying story of hope, resilience and human kindness associated with it as well. Friends and family members have demonstrated great strength, picked up the pieces and have come together to pick each other up. Co-workers have created a platform (this foundation) to remember and honor their lost friend and colleague. Many people have re-visited their faith and others have resurrected relationships, which may have appeared to be permanently broken long ago. An entire community has come together to show support and respect for one of its most well known families (every gesture whether it be small or large weighing the same in the recovery process). 2006 was also a year when Leanne’s friends, family members and colleagues (all of you) stepped outside of themselves and their grief to honor one of Leanne’s lifelong dreams: to provide hope for those who were less fortunate than her. In a very short period of time you have all come together to help with the pursuit of that dream. Your donations, whether they have been in the form of toys, books, dollars or volunteer time have provided hope and help to more families than you can imagine. At the health center Leanne was one part of an incredible team of volunteer and social work professionals who wake each day with the idea of making life better for those less fortunate. None of them are overpaid, none of them are under-worked and none of them are over-recognized for their efforts. They work everyday, anonymously, doing what they can to help those who need a hand. Through your support you have provided this team with the resources they need to do what they do best. This team and their team of volunteers are heroes to many and through your support you have become heroes to them. Because of your generosity there were more children with toys to play with during the holidays this year. Because of your generosity there will be special events for the students who are mentored at that health center this year. Because of your generosity expecting mothers will have better education on how to care for themselves and their newborns this year. Because of your generosity there will be more children leaving the inner city this year to attend summer camp. Because of your generosity there will be enhanced programming for special needs families this year. These are the things that create great experiences for people, and great experiences are what hope and motivation are made of. We will be doing a lot more in the new-year and we will continue to keep you updated as events occur. In the meantime, make sure you take a minute to smile and realize how much your generosity is making somebody else smile. You did not see the smile but, we can assure you, the smiles were there and they were there because of your generosity. The response from the community for the 1st Annual LDF Holiday Toy Drive was fantastic. We are so very pleased with the results. As mentioned in an earlier update, there were smiles everywhere throughout the entire toy drive process. Leanne’s family members, colleagues, and friends came together to collect toy donations for several weeks leading up to the holiday. Typically, families are sent gifts based on their child’s age range. However, after the toys were collected, we scheduled a day for the families to pick up toys for their children for the holiday. As a unique and special touch, we actually invited the parents to shop around at the pick-up location for toys that would best match their child’s personality. They were all very, very, very appreciative! Leanne would be extremely pleased with the turnout. She also would be really proud of everybody for taking the time to participate. Thank you again for your generosity. We hope your participation gave you a great feeling for the holiday. On February 26th we will encounter the first birthday without our wonderful friend. We expect this day to be somewhat challenging for many of Leanne’s friends, family members and colleagues. As many people know, it is very important to feel a sense of community on days like this and it is very important for those who feel the loss the most to know that others are thinking about and/or praying for their loved one. 1-Minute Of Thought: At 12 noon, EST, on February 26th many of us will be taking one minute to step back from whatever it is we are doing to think about Leanne in some way. Some of us might say a prayer, others will write a note on this message board, some will simply remember a favorite story or think about their own family, call a friend and say hello or just take a short break from our busy day. We invite you to join us. If we cannot be together physically we can always be together in thought and spirit. For Those Who Can Or Would Like To Do More: Many people have expressed a desire to do more. Some friends will be taking a few minutes on this day to talk with their children about the importance of community service, others will visit a member of the elderly community who might be lonely and still others might take some of the old clothes from their closet and drop them at a donation bin at a local church or community center. Anything that helps somebody less fortunate is a great way to honor Leanne’s life. Why Do It: Thousands have visited this site from across the country and around the world over the past six months and we thought this would be a good way to bring all of us together without actually being together. We hope that knowing this is happening will help you feel a little bit better on this very difficult day. As always we thank you for all of your thoughts and we wish the best for you and your family. Our first birthday without our friend has now come and gone. This week was probably the most challenging for all of us who care about and love Leanne. The numbness and initial shock of her loss is starting to “wear off”, which means we can all feel the pain much more acutely. One of the factors contributing to the pain is the feeling that maybe as time passes people will start to forget about Leanne and all of her great work. This feeling or assumption can really make people feel lousy. We can assure you though that, on her birthday, Leanne was not forgotten at all. On the contrary, she had more visitors during the days surrounding her birthday than any other period since her passing. Almost one thousand people came to visit her at her foundation’s web site this week. Most of you visited on her birthday and most of her birthday visitors made the visit during the noon hour, the time for our minute of thought. Many of you took the time to send notes off to Leanne, her family and each other. Your messages were so important and they brought smiles to so many faces. Leanne was not forgotten! There have also been many stories of community service shared with us over the past few days. We heard many stories of kindness this week. One friend spent some time at Children’s Hospital to lend a hand for a few hours and another friend even stopped on his way to work to help a woman get her car out of a snow bank. Just like many of the things Leanne did during her life, these were small gestures that will go unnoticed by everybody except the person who was the recipient of the generosity. Our favorite story is about Leanne’s dad’s day of service. On Monday Bob spent part of his daughter’s birthday helping out an elderly friend who lives in his neighborhood. When he stopped by and asked her if she needed anything, she mentioned that she was trying to get to the bank to cash a check and to the store to pick up some items she needed. Without hesitation Bob said, “Let me take you”. They got into his car together and he drove her to the bank so she could cash her check. After the bank they drove to Wal-Mart so she could do some shopping. When she was finished, Bob drove her back to the building and carried her packages up the stairs and into her home. Bob does not know that we know about this story and he would probably be embarrassed if he knew that we shared the story, but it was too important to not mention. Even though this was probably his toughest day, he found a way to make it positive by doing what his daughter would have done and would have wanted him to do. The two have always shared the same spirit. They both enjoy doing nice things for other people. Small gestures may sometimes seem insignificant, but to the person on the receiving end it can make all the difference. We will never forget Leanne and we look forward to hearing from you in the coming years. Leanne’s Dream Foundation would like to acknowledge the incredible work of Ms. Jennifer Wells. Jen and Leanne attended Revere High School together and have been friends throughout the years. Now a teacher at Revere High School, Jen recently took it upon herself to work with the Revere School System and create a scholarship in memory of her friend Leanne. The first Leanne Sasso-Lusso Memorial Scholarship will be presented this spring to a graduating RHS Senior who will be attending a four-year state school to pursue a degree in Health and Human Services. The idea is to help further the education of those who choose a career dedicated to helping others the way Leanne did. We plan on posting further information following the presentation of the scholarship so be sure to check back in. On behalf of the entire EBNHC and LDF teams we want to send a big thank you to Jen for making this possible. The scholarship is an incredible tribute to your friendship with Leanne and your relationship with her family. We look forward to helping you expand the impact of the scholarship in the years to come. We are a little bit late on this one but it is never too late to acknowledge a volunteer! This past week was National Volunteer Service Week. We would like to congratulate and say thank you to the entire East Boston Neighborhood Health Center Volunteer Service Team and to all of the volunteer workers who help them bring smiles to faces each and every day. These volunteers change people’s lives everyday through their work with the elderly, children and families. National Volunteer Week reflects the power that volunteers have to “inspire by example”. Volunteers both encourage those they help and motivate others to serve! They do their work because they want to make others feel better! Thank you especially to all of you who volunteer your time to help others. You are truly the heroes in our midst. We, sincerely, thank you for all that you do and we are in awe of your efforts. We are also in the process of finalizing the summer camp project sponsored by LDF. As soon as we have detailed information we will post a more specific update. As of right now, the applications are complete and the funding is in place. We are so excited to be sending these kids off to camp this summer. Some of us might even take a ride out to the camp to see how things are going. More to come on that, as well. Thanks to you these kids will have a wonderful experience this summer. This week we received great news from the State House. State Representative Kathi-Anne Reinstein, a childhood friend of Leanne’s, requested funding for LDF in the House of Representatives’ annual budget. Although nothing is definite yet, the request already passed through the House of Representatives. If the request also receives Senate support, it will proceed all the way to Governor Deval Patrick for budgetary approval. More information on its progress should be available in the summer. This is one of those stories that should probably not be shared yet, as we have no idea what the outcome will be. Regardless of the result, it is an honor for LDF to be considered. The real story for us is not about the money at all; it is about the efforts of yet another friend looking to make something special happen for LDF. Kathi, we appreciate the effort and want you to know that we will always consider you a friend of the foundation. Over the past year we have made a great deal of progress building up Leanne’s Dream Foundation. We have worked hard to create a platform that allows us to continue the work that was so very important to Leanne during her lifetime. As everybody knows, Leanne’s life was always all about helping others. Leanne always had a special place in her heart for the members of our Special Needs community. Over the years she formed a close relationship with the Revere League For Special Needs located in Revere, Massachusetts. On May 1st 2007, members of the LDF Steering Committee attended the League’s monthly meeting to make a very special announcement. Leanne’s Dream Foundation, The Sasso Family, Maggio’s Restaurant, and TD Bank Financial Group are teaming up to design, develop and furnish a brand new recreation facility at the League’s headquarters in Revere. Work should begin later this summer and we will be sure to provide you with more updates as work commences. The recreation center, tentatively named Leanne’s Dream Lounge, will be painted, furnished and stocked with all sorts of recreation activities for the kids who use the center. Initial ideas include a complete theatre screen and system stocked with movies, couches, chairs, tables, computers, board games, table games, wall games, exercise equipment, sports equipment, audio systems, cable television service, internet service and much more. This project will be something very special! This recreation room would not have been possible without all of you who have supported this foundation over the past year. This project is a tribute to your generosity. This is the result of you sending in a dollar or buying a t-shirt or a mug or donating your time to help set up the foundation. This is your donation, your work, your project and your foundation. This is your way of honoring your friend! We would not have been able to do this without you. For most of you, this will be project undertaken in your own community that you can look to and say “I am part of that with my friend”. Thank you so much. We would also like to say a special thanks to the team at EBNHC for all of your support. This would not be possible without your commitment and direction. More to come and God Bless. Last week Leanne’s mother, two of her aunts and one of her cousins presented a check to Father Kumar from St. Anthony’s Church in Revere. The check will support the Youth Group’s annual missionary trip to the Dominican Republic. This year about 20 members of the youth group will join Father Kumar and a group of adult chaperones on their trip to the Dominican Republic in an effort to both help the needy and help develop Leadership skills in the members of the youth group. LDF participation came about in a pretty cool way. Leanne’s mother, who has been a lifelong member of the parish at the Immaculate Conception Church in Revere (where Leanne attended elementary school), was attending the christening of a friend’s granddaughter when she heard about the trip. She later mentioned to her sister-in-law Norma, who volunteers at St. Anthony’s, what a wonderful cause this was and mentioned that she would want the foundation to help if they could. About a month later the team presented a check in the amount of $1,000.00 on behalf of LDF to Pastor Mike and Father Kumar in the rectory at St. Anthony’s Church. The check will go towards the budget for the trip. At. 4:30 A.M. on Monday, July 10, 27 members of St. Anthony’s Youth Group, including their adult chaperones, left for the Dominican Republic. This is the fourth trip for the Youth Group, who were led and inspired by the work of Dr. John Consoli and his wife, Jessica, who worked in the Dominican Republic for about 20 years. This year’s group included not only teens from St. Anthony’s, but also members from Beverly, Danvers, Ipswich, Maine, California and Wisconsin. Once in the Dominican Republic, the group stayed at Fusima ña, a Catholic retreat center high in the mountains run by Claretian priests. Mass was held daily in the beautiful chapel while daily prayer reflection was led by the adult leaders. The group spent several days working in the poor mountain villages providing a fun day camp experience for the children. The children were as young as infants and our oldest camper was 76 years old! More than 500 children attended day camp that included playing with Lego’s, coloring, chasing bubbles, hearing Bible stories, playing baseball and doing arts and crafts. Each child left camp with a “goody bag” which included combs, soaps, toothbrushes, toothpaste, coloring books and crayons, little toys and a rosary. Every camper went home with a smile. While one group was running day camp, another group spent its days working to repair and paint some of the village churches. The work was physically demanding but so rewarding! Many of the villagers came to help out and were so thankful for the effort to make their worship places more beautiful. The entire group made a trip to Pueblo Nuevo to visit San Alfonso church, which was built with the generous donations of parishioners from St. Anthony’s and St. Alphonsus of Beverly/Danvers. The last three days of the trip were spent in the capital city of Santo Domingo. The group stayed at the retreat center, Casa San Pablo. While in the city, the group returned for the second year to an AIDS orphanage, Casa Rosada, to spend time with the children. The Youth Group also visited an orphanage for young children called Escuela Do ña Chucha. We had the wonderful opportunity to meet with the founder, a 94 year old woman, who was an inspiration to all of us! She asked us to come back again. A visit to the elderly and infirm rounded out our visit to the Dominican Republic. During our final Mass together, Father Kumar asked the teens to share some of their experiences and feelings. All of the teens felt that their lives had been so enriched by the time spent in the Dominican. Many expressed the need to do more next year. Several want to return knowing more Spanish, learn more about children and AIDS, want to explore careers in nursing or medicine, and encourage more teens to become involved in mission work. We would like to say thanks to Father Kumar and the kids for taking time to make this happen. Leanne would love this story! And again, we thank all of you for helping to make this all possible. We cannot do this without you. Thanks to your generosity, Leanne’s Dream Foundation recently contributed another 500 books to the EBNHC Reach Out And Read Program. The Reach Out And Read Program is designed to help promote literacy while working to bring families closer together through books. The team at EBNHC recently put in an order for 3 paperback titles, 3 titles for children in the 1st or 2nd grade, and another title for new moms. We are very excited to help with this project, since reading is so important for everybody. Simply sitting down to read and relax often gets lost in this day and age of video games and 500 television stations. We hope to help families develop a good habit that will provide them with returns for the rest of their lives.